Everyone likes to save money, especially those who are handy with a screwdriver and are used to putting things together themselves. You may be perfectly capable of hanging blinds, so why not just do it yourself? Consider the time it takes, special techniques for doing it right, and how to handle tricky spaces. Hiring a professional might be the best choice, saving you time and money. Installing window treatments isn’t your day job, so it will undoubtedly take you longer than an experienced installer. As they say, you will need to measure twice and cut once. If you make a mistake, it can cost you both time and money. If you estimate that the project will take you one Saturday afternoon, you better clear your schedule for the entire weekend; and that’s if nothing goes wrong. Hiring an experienced installer will help your project be completed in a timely manner. All of the tools in your toolbox cannot help you install your window coverings if you don’t have the skill set. 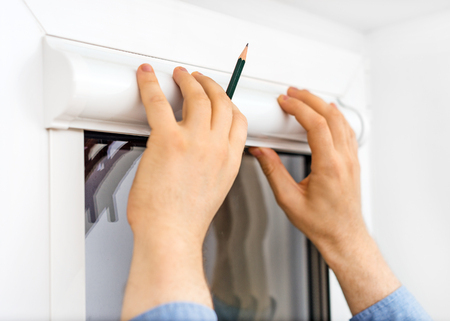 As with anything, measuring for window coverings takes practice and a special technique to be dependable and accurate. Whether you are hanging vertical blinds, cellular shades, or plantation shutters, there are adjustments that need to be made for an accurate fit. It takes a skillful hand to accommodate for uneven frames, or other factors unique to your space. It may be difficult for some to admit that installing window coverings can be tricky enough to call in the experts, but in the end you will be glad you did. There is no substitute for experience. Tricks of the trade are what separate the pros from the DIY’ers. If you are covering spaces with arches or round windows, an expert will do a much better job, simply due to experience. The experts know how to get that tight fit in difficult spaces and how to overcome issues that nobody expects unless they have been in the field a while. The best part is, if the pros mess up, they will do it over until it’s right. There are several other reasons to hire a pro, for example eliminating the stress of trying to get window coverings placed perfectly, removing the possibility of having to run to the store for a special tool, or the risk of damaging your custom products. Instead of saving yourself a couple of bucks in the beginning by doing it yourself, save yourself the stress, time, and potentially money in the future by having an expert install your window coverings. Installing window coverings isn’t your day job, so it will undoubtedly take you longer than an experienced installer. As they say, you will need to measure twice and cut once. If you make a mistake, it can cost you both time and money. If you estimate that the project will take you one Saturday afternoon, you better clear your schedule for the entire weekend; and that’s if nothing goes wrong. Hiring an experienced installer will help your project be completed in a timely manner.